Sunday began by leaving the hotel at 9:15 to travel to the Iroquois community which we visited yesterday evening. Before leaving the hotel, we had the pleasure of having breakfast at the hotel restaurant. Breakfast consisted of cheese, eggs, plantains, toast, and rice and beans. We spent the morning at the community learning crafts from three local women. We learned how to make cards from Yessica, bows from Wendy, and animal clothes pin crafts from Doña Rosario. These crafts were all made from supplies collected from within the community, whether recycled or bought from local shops. After they shared their skills with our team, they showed us other crafts that they had made. These crafts were available for sale and some of our team saw crafts that they chose to purchase and were amazed by the talent demonstrated through art. At first glance, you would never think that these crafts were made with recycled or reused materials. 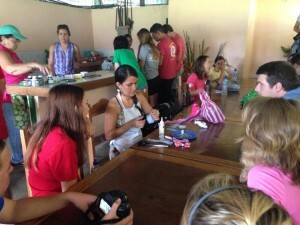 We have seen first hand how resourceful and rich the Costa Rican culture really is. After all of the crafting was finished and cleaned up it was time to learn how to prepare fruit. We learned about casava, plaintains, bread fruit, papaya, mango, chaiyote, pineapple, coconut, mamanchino, and granadilla. Not only did we learn how each fruit is grown and prepared for cooking, but also got to taste them. Well, the ones that you are able to eat raw. It is crazy how much better the fruit tastes when it doesn’t have to be imported across hundreds of miles to reach its consumer. After learning about all of these fruits, it was time for lunch. Lunch consisted of chicken, rice, vegetables, and fruit juice. The chicken was infused with coconut and was some of the most flavorful chicken I have ever tasted. The chicken was as fresh as you could get; straight from the community. Also, the fruit juice here in Costa Rica is absolutely to die for! After refueling, we went next door to the health center to lead activities for the children of the community. 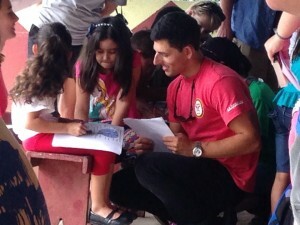 These children learned about the needs of animals such as food, water, and shelter as well as expressing their artistic abilities through coloring. Some even mentioned that they need love. After this, they learned about plant and animal cells as well as how cells ultimately make up us as humans. After a fun and educational experience, we took part in a friendly futbol game on the field in front of the health center. We had about an hour of extra time so we came back to the hotel to rest and cool off. At 5:15 we went back to the community for dinner. Dinner was spaghetti, salad, and garlic toast. It was touching to have them make a dish that they knew would remind us of home. These women completely accepted our entire group as part of their own family. This was a feeling that can rarely be experienced within our own country, much less a completely different country that doesn’t even speak the same language as us. Although many of us could not speak directly to the women without a translator, there was a connection that allowed us to feel comfortable and trust one another. For desert we had rice pudding, coconut ice cream, and pineapple mango ice cream. Everyone agreed that all of the desert options were delicious. After eating dinner we thanked Wendy, Doña Rosario, and Yessica for their hospitality. Before leaving the community building, we could purchase pocketbooks and wallets made out of can tabs from a lady in the community. The final thing we had the opportunity to do in the community was go inside of one of their houses and see how they live. Many of us have never been outside the country and have never seen a house like this. Seeing where they laid their heads down to rest at night was a direct connection that we could share with the people within this community and realize just how blessed we are. This experience truly brought a different way of thinking for our group as a whole. Today was definitely a groundbreaking day. • Coconut Oil: Super Food or Myth? • Lighten Up the Sweets This Thanksgiving!